Want to learn more about the dog flu shot? Read this article by my friend, Dr. Paula Terafaj, of Founder’s Vet in Brea. I think it’s an excellent compa nion to my Truth4Dogs dog flu shot article. Before you vaccinate, investigate! What’s the implication of that jaw dropping statement — or this quote by the American Veterinary Medical Association (AVMA): “The AVMA believes there is urgent need for an effective canine influenza virus (CIV) vaccine to improve the health and welfare of animals and reduce the financial impacts of canine influenza.” Good grief! Will our dogs drop like flies? What’s up Doc? Up to 8% of clinically ill dogs may die from complications of canine influenza, H3N8. Notice “up to” and “may die” — that’s a lot of wiggle room for a hyped-up claim. And yes, this statement was the shocking headline on the hand-delivered eight page glossy brochure secretly left on my desk — spotted with impressive graphs, charts, and other interesting data. Strangely, no prediction of a fatal dog epidemic has been made by any ‘expert’ not on Schering-Plough’s payroll. First of all, improving the health and welfare of animals says nothing about reducing the risk of death or serious complications by the virus. You could also improve the health and welfare of your dog by feeding a better diet! The second implication in this statement, reduce the financial impacts, warns that flu outbreaks could result in loss of business revenues by pet related businesses forced to close their doors temporally to prevent further exposure. Ahhhh — too bad. But this Doc doesn’t follow the money. Now read the fine print disclosure: Schering-Plough’s newest vaccine darling has been licensed as conditional by the USDA — meaning the data submitted supports a reasonable expectation of efficacy. Since the AVMA has decided to call this conditional vaccine effective, it would be wise to check their stock portfolio. The Canine Influenza Virus-H3N8 (CIV) vaccine will be up for regular licensing in one year unless evidence (provided by an emerging population of dogs soon to fall victim to vaccine junkie vets) shows that it is ineffective and/or results in a higher than acceptable number of adverse reactions. Will your dog be the guinea pig to test its effectiveness and risks? What you need to know: CIV H3N8 belongs to a syndrome of canine respiratory illnesses and cannot be easily distinguished from garden variety kennel cough! So, will your vet know if your dog gets the new doggy flu or good old fashioned Bordetella bronchiseptica? Well, since Bordetella (the vaccine given to prevent kennel cough) is just one of 20 different infectious pathogens responsible for kennel cough — probably not. So, out come the common prescription of cough suppressants, antibiotics (if indicated), and rest. Canine Influenza Virus (CIV) was first reported in March 2003 in Florida — when racing greyhounds became mysteriously ill. This virus appears to have mutated from an equine virus to infect canines. Here’s the likely scenario: racing greyhounds on race tracks in contact with horses (add in the stress of being raced for profits!) provided a ripe opportunity for the equine virus to jump species. Similar to the bird flu and swine flu — a phenomenon well documented. Reality check: Flu viruses are most likely to make you sick and deaths from complications are rare. Those most susceptible to viruses are the young (immature immune systems) or those that cannot mount an effective immune response — poor health due to illness and other stresses on the immune system. Does that make you or your dog a sitting duck for flu viruses? NO! You can take active measures to improve immune function and fight off viral attacks. Start with the best diet you can afford — good health starts with good food! For all my diet recommendations, browse articles posted under Nutrition: Facts and Fiction. Next, add proven immune boosters like medicinal mushrooms. * Powerful mushroom combo’s containing Maitake (Grifola frondosa), Reishi (Ganoderma lucidum), Cordyceps (Cordyceps sinensis), Shiitake (Lentinula edodes) and The Turkey Tail (Trametes versicolor) have earned a respectable place in my preventive medicine cabinet. And for my book club fans — here’s a fantastic book about how mushrooms can heal our world: Mycelium Running: How Mushrooms Can Help Save the World by Paul Stamets. Anyone interested in natural solutions for global pollution, deforestation and environmental health challenges will find this book an invaluable resource. You can also increase protective efforts by adding antioxidant combos with supplements that contain the “ACES”: beta carotene (provitamin A), vitamin C, vitamin E and Selenium. Remember that plants are natural sources of immune boosting antioxidants. Colorful veggies (orange carrots, yellow squash and green broccoli) and fruits — most notably the berries (blueberry, strawberry, raspberry, and blackberry) offer many natural health benefits. Food as medicine is Nature’s best bargain for health! Take home point: Closed environments are required to spread canine influenza virus and other contagious respiratory pathogens — making shelters, boarding kennels, breeding facilities, and pet shops the most likely targets. The dog that sleeps on your bed, plays in dog parks and romps around the neighborhood is not considered to be at risk. Word to the wise: Become an informed health care consumer — not easy money from those who stand to profit the most, Big Pharma and the doctors they seduce. Digging for the truth about the new flu vaccine, pet health advocate Jan Rasmussen interviewed several vaccine experts and reported: respiratory vaccines have dubious effectiveness and known propensity to adverse reactions. More info on Jan’s blog: Truth 4 Dogs. You can always count on Jan to blow a lot of whistles! In conclusion, my dogs won’t be getting the new doggy flu shot, nor will I be standing in any swine flu shot line. We are popping mushroom capsules and eating wholesome foods with an extra helping of fruits and veggies. I am also washing my hands a lot more and avoiding people as much as possible . f a dog has been ill for less than 4 days, nasal and pharyngeal swab submission for Polymerase Chain Reaction (PCR) testing can be performed. If the PCR indicates a positive result, the dog is most likely infected. Negative PCR results may be falsely negative if the swabs are not collected during the time of peak virus shedding – the first 4 days of illness. Other diagnostic options applicable to dogs that have died from pneumonia are viral culture and PCR analysis using fresh lung and tracheal tissues. Without diagnostic testing there is no way to determine if the cause of respiratory illness you report was due to CIV. In general, the vaccine is intended for the protection of dogs at risk for exposure to the CI virus, which include those that either participate in activities with many other dogs or are housed in communal facilities, particularly where the virus is prevalent. If you foster dogs or raise puppies that could have been exposed in a shelter or other type of kennel environment – it is best to isolate those dogs for 7 – 10 days before introducing them to other dogs. The majority of infected dogs exhibit the mild form of CI. In the mild form, the most common clinical sign is a cough that persists for 10 to 21 days despite treatment with antibiotics and cough suppressants. Most dogs have a soft, moist cough, whereas others have a dry cough that is similar to that induced by Bordetellbronchiseptica/parainfluenza virus infection. Dogs may have a purulent nasal discharge and a low-grade fever. The nasal discharge is usually caused by secondary bacterial infections for which antibiotics should be prescribed. Deaths occur mainly in dogs with the severe form of disease; the mortality rate is thought to be low at 1-5%. Since I write for the average dog owner the point I wanted to stress is that the canine influenza vaccine is a “lifestyle” vaccine, and is not recommended for household pets with no to minimal risk of exposure. As always, I encourage all dog owners to make informed decisions before vaccinating. SueMatt, thanks! I’m glad you like the blog. Stop by again soon. Hello Jan, I would like to clear something up from your information you provided about the Canine Flu. The H3N8 did not undergo any “mutation” to infect the dogs. The fact is that this was the first time ever of a full genomic protein sequence jump from the dogs to the horses. The very virus has not changed and this is a first in evolution…..proof that the exact virus that was sprayed up into the noses of the race horses on those tracks that shared locality with the dogs. This is proof positive that the dangers of a virus jumping species without a need for mutational change will soon be coming to humans as well. These influenza viruses all originated from the duck intestine and then from ducks to other birds. The horse flu actually came from birds in North Korea thought to have bird flu, the virus sampled by the UN investigator. Interesting as the UN is owner of the intellectual property via WIPO for the majority of these viruses, including H3. The dogs that get the canine flu vaccine will be shedding virus and this is a danger directly to every mammal that shares a house with the vaccinated dog. I am going to privately email you a very long article by Dr. Micahel Fox that spells out the “big picture” problems with this laxity between the AVMA, Internet Schering Plough and every veterinarin that engages with the circulation of this virus through vaccination. Thanks for much for the clarification, Patricia. I want to let readers know that you’ve written a wonderful, startling book on vaccination. They can buy the e-book Mark of the Beast at http://dr-jordan.com/ or the hardcover at Amazon. Thanks much for this great site and wealth of info. Appreciate the insight into vaccines and their dangers. You helped me decide NOT to vaccinate our 5 dogs. Dr. Jordan’s site looks awesome also! Joy, I’m delighted my Truth4Dogs.com blog has been useful. If you’re near So. Cal., I hope you’ll come to our Safer Pet Vaccination Seminar in March. http://www.petseminar.org It benefits the Rabies Challenge Fund. If you don’t know about the Fund, please check it out at http://www.rabieschallengefund.org. I am writing to you to make you aware of a reaction to the New Canine Flu Vaccine. I live in Florida and had my dogs recently vaccinated. My Golden appears to be fine, but my little Shepard mix isn’t doing very well. My Vet and I believe the Canine Flu Vaccine has played a role in NICO’s recent illness. The timing and similarities are just too distinctive to be ignored or ruled out. NICO was Diagnosed with Immune -Mediated Hemolytic Anemia after receiving the new canine flu vaccine on 12/24/2009. My vet required the dogs be immunized prior to being boarded. When I picked NICO up from the vet on Monday 12/28/2009 he was already showing signs of being ill. When he came out to me he was barking in a strange way. It was almost like a yelping type of bark and he seemed stressed. ( A very unusual behavior that was not noted on any previous boarding’s). When I walked him to the car he wouldn’t jump in. I had to pick him up and I did notice that his back was arched and thought that was a little odd. NICO then laid very quietly in the front seat of my car and remained that way all the way home. Once at home he acted the same way. He was withdrawn, refused to eat and vomited once that evening. He appeared as though he was traumatized. Luc was fine, happy and wanted to play, but NICO did not want any part of that. I thought he was just stressed from being boarded and just needed a day to recuperate. During the night I noticed he was shaking as though he was chilled, so I covered him with a blanket. In the morning his condition did not change. He refused to eat and vomited up what little water he did drink. He appeared to be slightly lethargic and I noticed some weakness in his hind legs. When NICO urinated his urine was noted to be an Orange /Red color I called the vet and NICO was brought in. I also noted the color of his gums appeared pale, not normal. I took him back to my vet. His temp was elevated to 105F. He was jaundice. His Bilirubin was elevated above 10.0. His alk Phos was also elevated. His stool also had an Orange tinge to it. The Vet immediately ran some tests, diagnosed him with Hemolytic Anemia ( AIHA), and was very quick to begin IV fluids and Steroids. It was at that point I started to suspect a reaction to the Canine H3N8 Vaccine. As in humans, AIHA in canines can occur as a result of an environmental factor. Canines as well as humans can develop AIHA when they’re exposed to certain environmental triggers. There have been reports of canine AIHA caused by bee stings due to the constituents present in bee venom, infectious agents such as a bacteria, viruses, and parasites. Vaccinations, certain medications, including antibiotics and analgesics, and other toxic agents have been noted as well. Nico was in a very protected enviroment at my Vets Boarding Facility. I seriously doubt he got into anything while boarding which leaves the possibility of a reaction to the flu vaccine. Knowing very little about this vaccine I called the Intervet/Schering-Plough to obtain more information and to report a possible reaction. ( This is something I would have done if a human had a reaction to a flu vaccine). Unfortunately they are closed until after the New Year, but they did leave a forwarding number to the ASPCA in case of a possible vaccine related incident such as this. The ASPCA was very concerned and took a report. I am a Nurse and my assessment skills do not stop when I leav work. It’s part of who I am, and I tend to jump in and investigate any situation. And when it comes to my family it doesn’t matter whether it is human, canine or feline related, I become very pro-active in finding out what is wrong and what the cause may be. After a very long 2 week hosptalization which included IV fluids and 2 blood transfusions. Nico was sent home on 40mg of Prednisone a day and 25 mg of Imurana days plus G.I support which consists of Pepcid, Carafate, Forti-flora, and Reglan. CBC’s and Chem Profiles are done Bi-Weekly. his Total Bili has come down to 0.4 from over 20. His HCT peaked at 43 but has reently dropped to 32. The Vet thinks Nico has developed a small GI Bleed and we recently reduced his Prednisone to 30mg daily. GI support continues. My vet and the staff have been supportive and helpful during this recent crisis with NICO. We can only wait, hope and pray that NICO is strong enough to fight this. I have contacted the pharmaceutical. They want me to write a letter, which I am doing. I’m sure that’s true, and I’m glad that for once a vet has admitted a problem with a vaccine. But did the vet tell you before vaccinating that this vaccine had only provisional approval and warn you about adverse reactions? The canine flu vaccine has had only limited testing. No one knows if it’s safe or even effective. Not one of my vet friends would give it to client’s pets. You may not like my response, and for that I apologize. I wish you and Nico the very best. I hope you’ll keep me informed, and thank you for alerting others. I’m sorry about Nico having troubles with that H38N vaccine. Lak, Debbie, make sure you report every detail of the side effects to the vet and that you report the incident to the vaccine manufacturer. It’s possible they’ll help pay for medical help. At the very least, they’ll have to report it to USDA. If more reactions were reported, fewer people would give shots. Also, I hope you find a new vet. Nothing would make me (or my vet) give my dog this shot, or any other unnecessary shot. Also, reconsider kenneling your dog. That experience alone can be very tramatic. You can often find someone to dog sit for the same cost. Or see if a friend will take your dog. You’ve seen how a shot can ruin your dog’s health. If you can find a vet trained in homeopathy to help with the vaccine reaction, do. Find a referral list at http://www.dogs4dogs.com/vet My vet does phone consults for just $2.50 a minute/10 minute minimum. http://www.healinghope.net Otherwise, contact marina at naturalrearing.com (She’s not a vet, but knows homeopathy.) Tell her what happened and ask her to recommend a remedy. You want to make sure there are no lingering effects even if your dog seems to be recovering. Really. Do this! It’s important! My min. schnauzer had to be put to sleep on Mon 8/2/10. After kenneling her in April 2010 & having (1) part of the flu shot – within 3 months she stopped eating, started peeing in the house, falling on her side & passing out, drank water all the time, didn’t want to walk after awhile, or just stood up and wouldn’t lie down. I know she was 13 years old & 3 months, but it is very councidental that this all happened so fast after being in the kennel and getting the flu shot. I also am not sure if the kennel had put her in an in-door/out-door cage (in which I had asked for, and she always got the run of the house). So she may have had some extra stress on her because she didn’t see any sunshine, fresh air while we were on vacation for a week. I guess I will never know what exactly happened. My 1.5 year old red doberman received this vaccine inorder to board for a weekend in mid August at a veterinary hospital. She has not “acted” ill but about a week ago I noticed that she appears to be losing pigmentation (not white but pink where she once was brown) on her outer nasal flaps and inner lips. The fur just under her nose, where her whiskers are also appears somewhat lighter than the surrounding fur on her muzzle. I feared that this was the beginning of Vitiligo but her breeder asked if she had recently been vaccinated as she had recently heard a similar story that was connected to a vaccine reaction (not certain of which). Needless to say, I will not be boostering this vaccine but wonder if I need to see the vet. Any feedback is greatly appreciated. Tracy, I’m stumped. I haven’t heard of this reaction before. It wouldn’t hurt to check with your vet. Sorry I can’t be of more help. I would do some more research. Hearsay from a breeder is not sufficient medical advice. You might calling the manufacturer of the vaccine. In any event, it should be reported. I am so very sorry to hear of the dogs and their human parents who have suffered because of the dog flu shot – my heart goes out to all of you. I had considered and even planned to take my dogs to the vet tomorrow to get theirs but am so glad I read this information as I will definitely NOT get this vaccine. Thank you so much for the great information contained on this website. Its been over a year and a half since I first contacted you about my dog Nico developing IMHA after receiving the K9 flu vaccine. It has been a long recovery period for him, but so far he seems to be doing well and back to his old self. My Vet continues to followed up on his recovery very closely. Nico’s has been weaned completely off prednisone this past May 2011. So far his Hgb, Hct and Total Bili have been within normal limits. His follow up appointments are now once a month and his next blood test is next week. My Vet has consulted with other Vets across the USA and it has been decided that Nico can no longer have another vaccine due to that fact it can easily trigger him to get IMHA again. The risk isn’t worth it. It has been a very long and expensive recovery period. My vet no longer offers this vaccine, and I no longer see it advertised in the local pet stores. If the original literature would have included all of the adverse reactions and warnings, this entire situation could have been avoided. Unfortunately, they failed to disclose any of the reactions or side effects, including death in the original literature. My heart goes out to all of the other dog owners who lost a very important member of their family because of this K9 flu vaccine. Even though Nico seems to be fully recovered, we worry about relapse. I am always watching and observing for the slightest change. Vacations now include the dogs and our destinations are always in the vicinity of a reputable vet. In the past two years I learned that the law views pets as property. I also learned that this view is slowly changing. Hopefully the pharmaceutical companies have learned that our pets are very important members of our family. We love them, and we do not view them as property. When they become sick, or hurt, we hurt. We will stand up for our four legged family members and fight for them as their advocate. There is a good reason why they are called our K9 kids because they are. Terrie, I’m so happy to hear that all is going well. And good for your vet for being an advocate for your dog. I hope she/you reported the problem and that the pharmaceutical company paid your vet bills. Re Big Pharma caring about our pets, I’m skeptical. I think they are interested in the bottom line. Why else would they push vaccines that are dangerous and have annual revaccination recommendations on their vials? I hope you make them pay for your dog’s illness. I am wondering if my six year old golden retriever is having a reaction to this vaccine. He has been vomiting and not eating since he had the vaccination a month ago and we have been working on this with a vet during this whole time. He doesn’t have abnormal blood work but we are now checking for Addisons. Hi Kathy. It’s hard to know if the vaccine caused the reaction you described. Vaccines can stress an animal causing a number of reactions. Or maybe it’s just a coincidence. However, if the vomiting and lack of appetite started right after the shot — well, I’d certainly consider it. Have your vet show you the “product insert” for the vaccine. Check for these reactions. Sometimes vets don’t realize that a particular reaction is commonplace. Also, contact the vaccine manufacturer. They may well say they’ve never heard of a reaction like this (they too often do no matter what the reaction), but they’ll have to report it to the USDA. But maybe they’ll surprise you and help. My cockerpoo was required a flu shot for boarding. He has been sick for 11 days and I am very worried about him. His urine is highly concentrated, barely eats his food or treats and is extremely sleepy and lethargic. He was 18.5 pounds and now is doen to 16.0. The vet said his vitals are normal and give him a Rinadyl for inflamation 5 days ago. he wouldnt take it and was gagging. He’s not getting the second part of the shot cause Im afraid hed die. Im still concerned cause his recovery from the firts part really knocked him out and Im afraid he may die from it. Eric, your dog needs a vet that knows want he/she is doing and needs help fast. Have you contacted the drug maker? 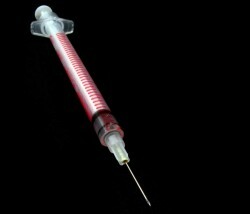 Please read this article: http://www.dogs4dogs.com/blog/2010/12/02/what-to-do-when-your-dog-has-a-vaccine-reaction/ You’ll find lots of info there. You need a specialist. Rimadyl is a dangerous drug. Where do you live? Maybe I can find you some help. Or I can get you a phone consult. I’ve had two dogs have reaction. One almost died costing me thousands of dollars. I am furious there aren’t more warnings. people just do it because the vet says so and this is wrong!!! something needs to be done.